Well, it’s that time of the year again; Advent. We will have already seen the many sights and sounds of Christmas around us these last few weeks. The shops are already fully decorated with Christmas trees and lights, various sizes of Santa Claus adorn every shop window and Christmas songs and carols can be heard everywhere. All of these things are an important part of the next few weeks preparation for Christmas. But they are not the most important of these next four Sunday’s in December. Despite what the shops, the media and all the wonderful advertisements on television are telling us; it is not Christmas; not yet! He is a sign of hope and faith for us; he will ask us to get ready to welcome God’s Chosen One. 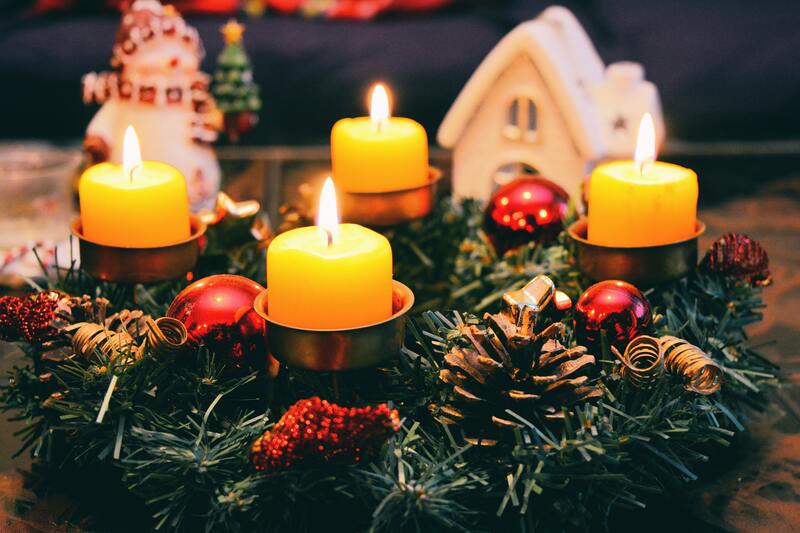 The evergreen Advent Wreath with it’s candles burning brightly will help to make this journey of preparation prayerfully one week at a time. While the shops and the media will encourage us to move faster and to spend more, the prayers and symbols of Advent ask us to slow down so that we will not miss what is at the very heart of our Advent Journey: preparing our hearts, lives and homes to welcome and celebrate the birth of Jesus. So, in our first gospel for Advent, Jesus speaks to each of us very clearly and directly when says, ‘Watch yourselves…. And Stay awake.’ What do these small but important phrases really mean for us as we begin Advent? Jesus challenges us to watch ourselves so that we don’t become careless, causal or complacent about the way we live our daily lives. It can be all to easy for us to convince ourselves that it doesn’t really matter how we live our ordinary lives; it does matter. In the letter to the Ephesians, St Paul writes; ‘be very careful about the sort of lives you lead…’ This is meant as an encouragement as well as a challenge. Advent, like Lent asks us to pay extra attention to how we speak to and about others. We are asked to consider prayerfully how we treat others in our homes, our schools and in our work places. This is how and where Advent takes place; in and through our ordinary daily lives. Jesus asks us to stay awake in case we miss what Advent is really about. Behind and beneath all the wonderful preparations for Christmas that we will take part in, we are asked and called not to forget that we are preparing to welcome God becoming one of us in the very person of Jesus. If we get too caught up in all the shopping, spending and being busy, there is the chance that we will forget or even miss what Advent and Christmas are really about. So, as we prepare to clean the house, buy presents and decorate the Christmas tree, may we also prepare prayerfully for what lies ahead: we are preparing to welcome someone, not simply getting ready for something. My God bless each of us, our homes and our families over the coming four weeks of Advent. May we do all we can to stay awake as we wait in joyful hope for the coming of our Saviour Jesus Christ.